Win a pair of India v Pakistan tickets in Manchester! The Wickets campaign has arrived in Manchester, giving fans the amazing opportunity to win a pair of tickets to India v Pakistan at the ICC Men’s Cricket World Cup 2019! Cricket World Cup excitement is sweeping through Manchester as the first Super Saturday of the #CWCTrophyTour, driven by Nissan, takes place in Exchange Square this weekend. 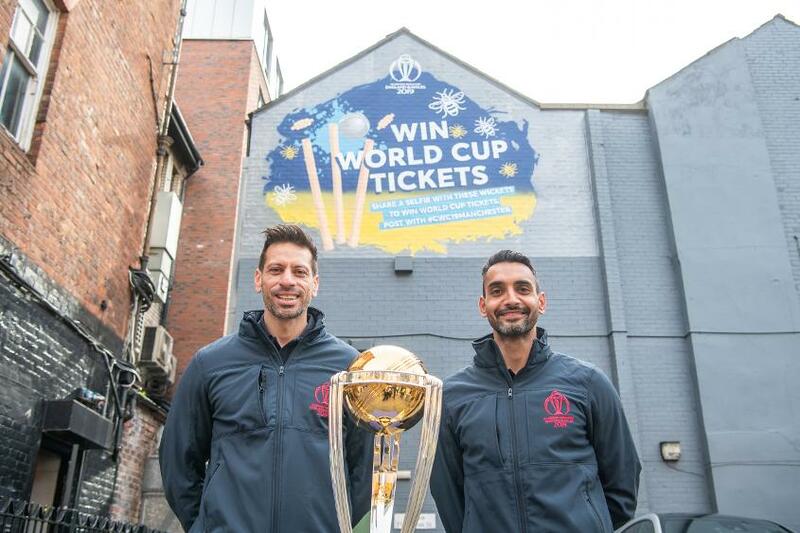 The mural, which has a unique design for Manchester, will be displayed on Thomas Street & High Street for just 48 hours, so fans have to be quick if they want to enter the competition to win a pair of tickets to the one of the most sought-after games in cricket this summer! To be in with a chance of winning the ultimate day out at #CWC19, entrants must share a picture of the mural across Twitter and/or Instagram using #CWC19Manchester. The lucky winner will be contacted by a World Cup representative. England ODI captain Eoin Morgan, as well as former internationals Sajid Mahmood and Ajmal Shahzad, were on hand to help launch the mural in Manchester, which coincided with the first Super Saturday of the #CWCTrophyTour. Terms and conditions for the Wickets competition can be found here.